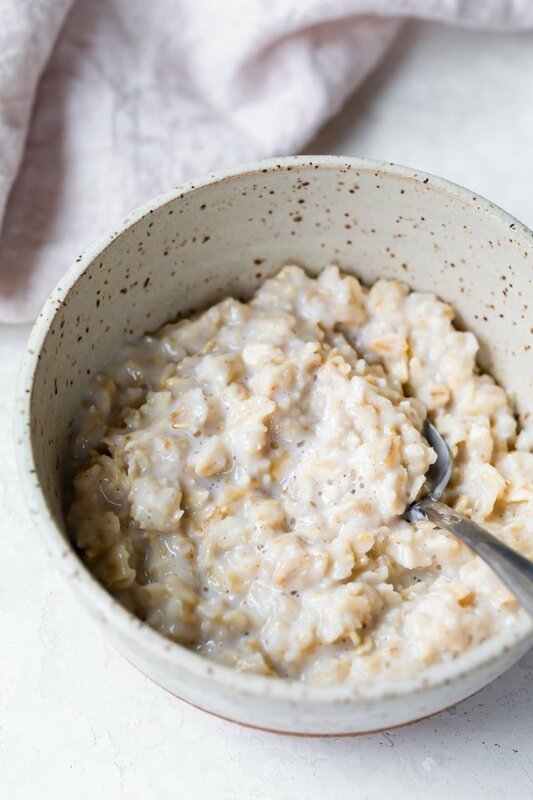 There’s one thing I buy in jumbo size in my house – it’s old fashioned oats! 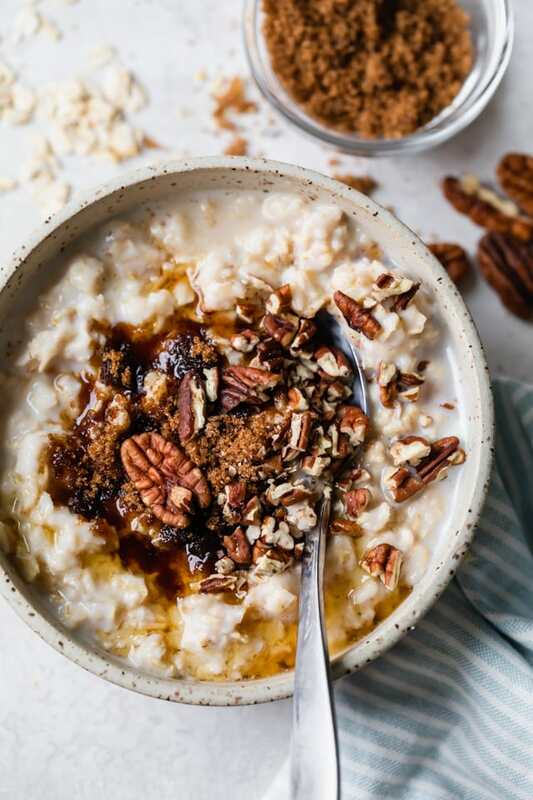 I eat oats for breakfast Monday thru Friday – in the summer I love cold overnight oats, and in the winter, I’m all about warm oatmeal! I share my bowl of oatmeal often on Instagram and Snapchat and I always get questions about how to make oatmeal. So I’m going to share with you today how to make this easy staple recipe. 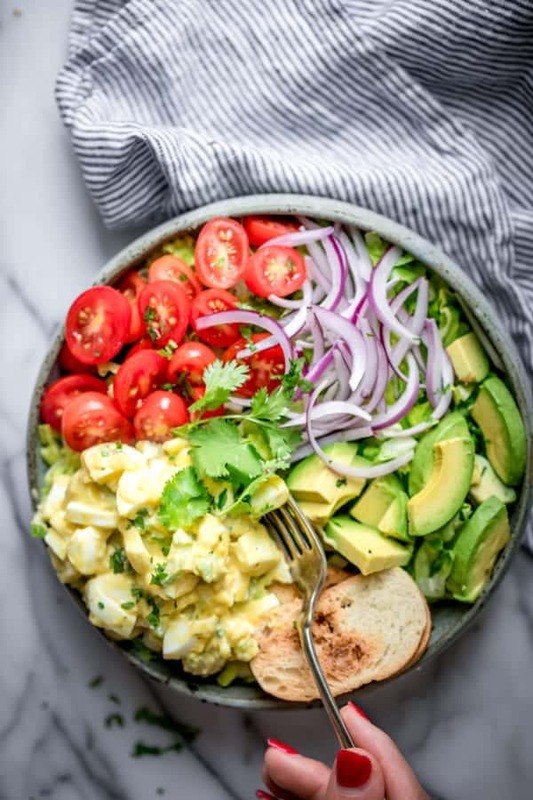 And you’ll never wonder again what to have for a healthy breakfast! 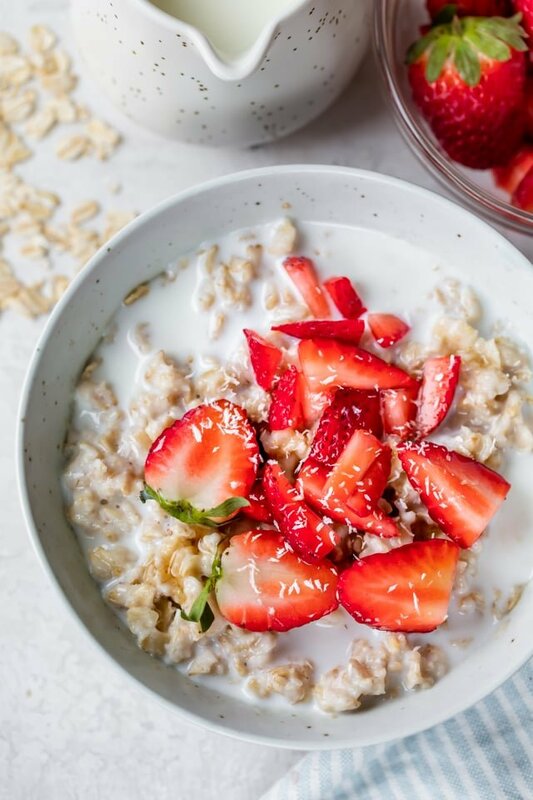 What I love about oatmeal is that it’s really quick and easy to make, you can customize it with any toppings, and it keeps you full with lots of energy to last your morning! And I love that routine in my morning to have something consistent that I know will make my body feel good. It all starts with the simplest ingredients. You’ll need old fashioned oats or rolled oats, milk, water and a dash of salt. 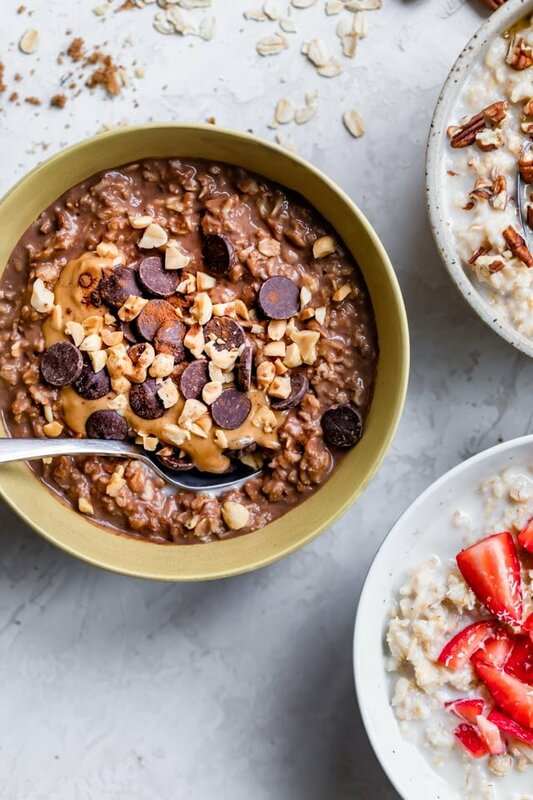 Those are the only 4 ingredients you need to to make oatmeal. There are 4 types of oats out there. There are quick oats, which are more fine oats that can be cooked really quickly. You can certainly use those, but I don’t recommend them because they are more processed in general and only save you an extra minute of cooking time. 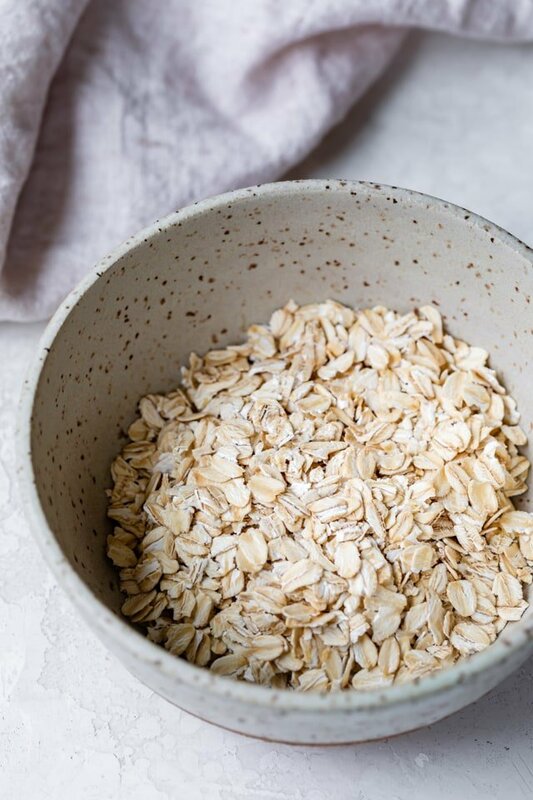 Then there’s old fashioned oats and rolled oats, which are pretty similar, but the rolled ones are slightly rolled/pressed, which makes them more processed. These are thicker than quick oats, so they need more time to cook. Either old fashioned oats or rolled oats work great for this recipe. Finally, the fourth type of oats are steel cut oats, which are the whole oat, unrolled and unprocessed variety. 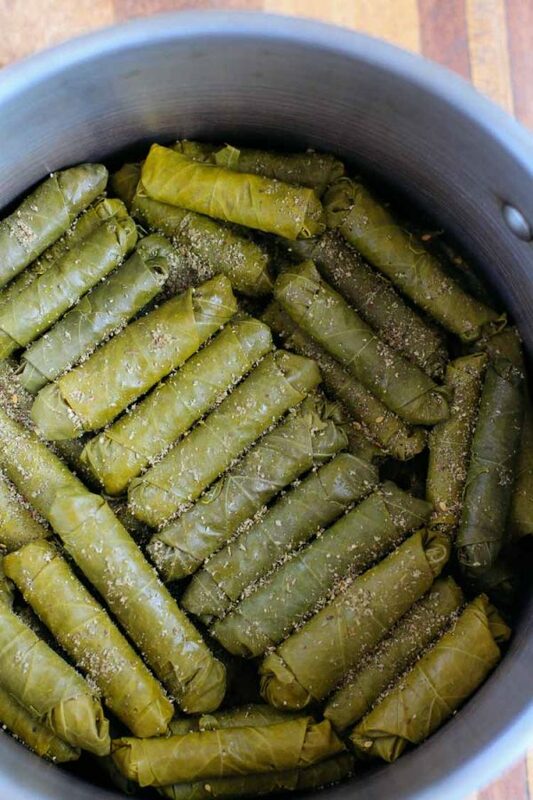 These take the longest time to cook, and need at least 20 minutes on the stovetop. We’ll discuss those another time. Start by measuring the oats and liquids. The ratio is 1:2. The usual serving size is 1/2 cup oats to 1 cup of water, milk or combination of both. I like combining 1/2 a cup of water and 1/2 a cup of milk for the best consistency. Then place in the microwave without a cover on it (we don’t want any microwave accidents when the liquid boils). Microwave on high for 2 minutes and the consistency should be perfect. For the stovetop, you’ll still use the same ratio of old fashioned oats to liquid. But to start, you’ll want to bring the liquid to a boil in a small saucepan. Then reduce the heat to low and pour in the oats. Allow them cook cook until they thicken and absorb all the liquid, stirring frequently. It will take about 5 minutes. 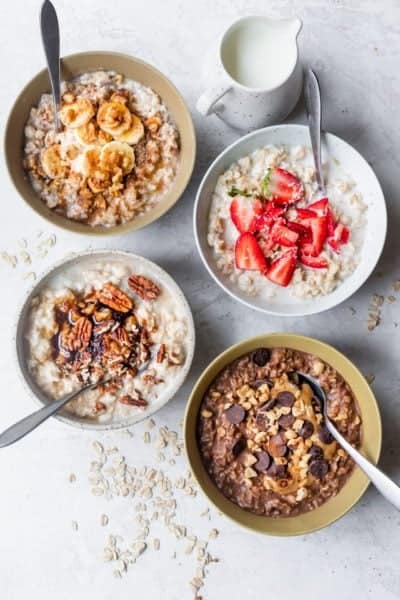 Regardless whether you use the microwave or the stovetop instructions, now you know how to make oatmeal and how quick and easy it is. 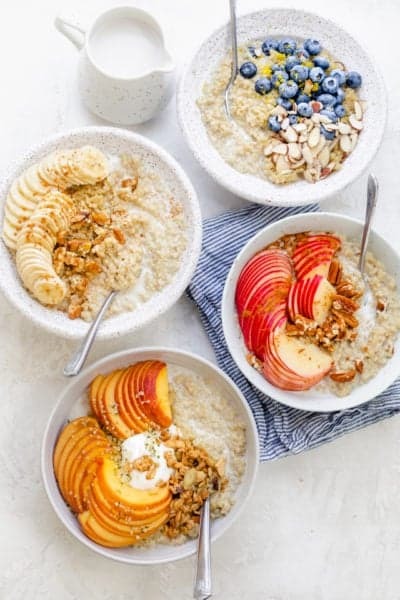 The result is a warm cozy bowl of soft creamy oatmeal that’s ready to be topped with your favorite add-ons. Maple Brown Sugar: This is a classic flavor most oatmeal packets come in. But the homemade maple brown sugar is so much better. I make it with brown sugar, maple syrup, pecans and cinnamon. 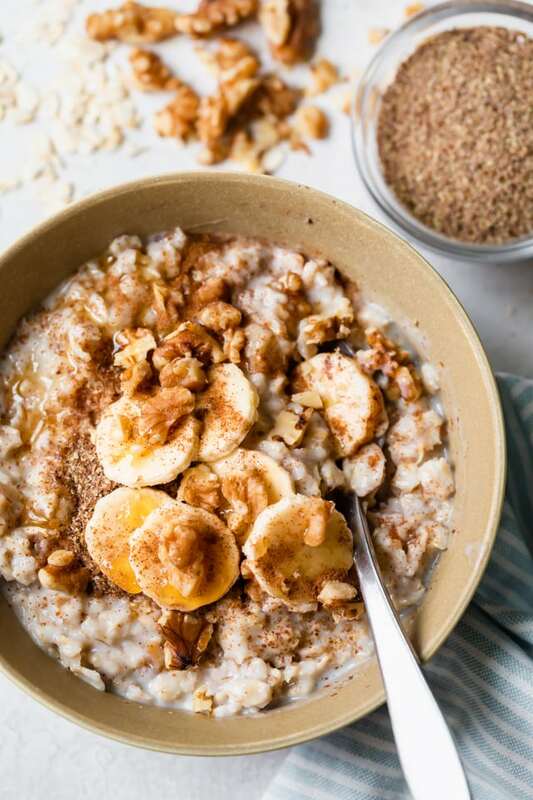 Banana Nut: This is another one of the classic oatmeal flavors that comes in a packet, so I love recreating it with actual fresh bananas (not the taste of bananas). I usually slice half a banana and add walnuts, ground flaxseeds and cinnamon. Strawberry & Cream: This is such a dreamy yummy combination. 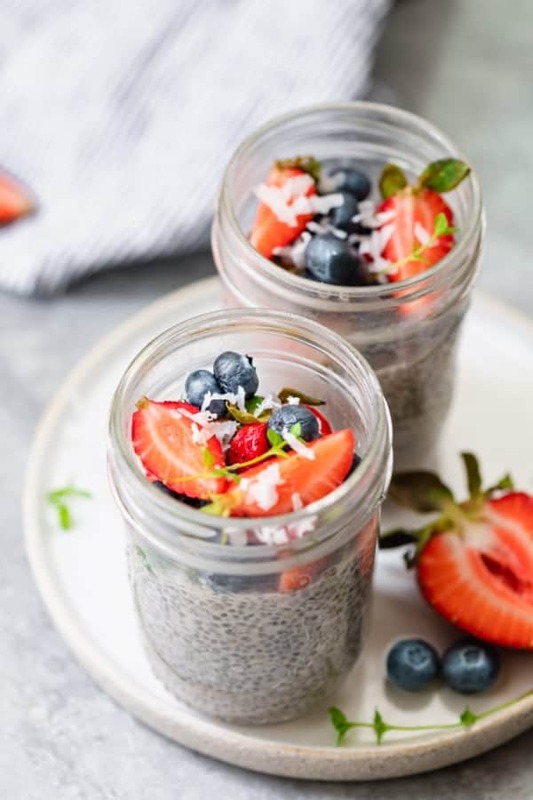 Just add fresh sliced strawberries, a splash of half and half or coconut cream or any non-dairy creamer, along with some honey and a touch of vanilla extract. Chocolate Peanut Butter: This one’s for the kiddos. And who am I kidding, sometimes for me too! When the oatmeal is still warm, I stir in cocoa or cacao powder and keep stirring until the mixture looks chocolatey. 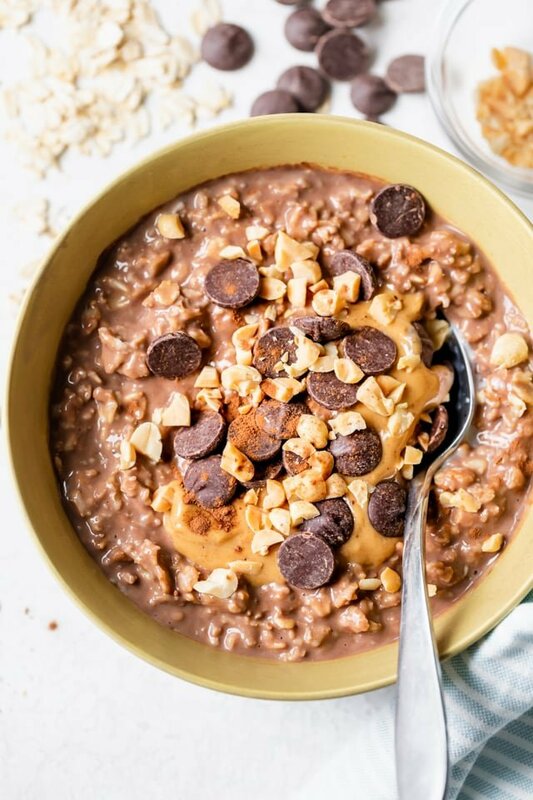 Then embellish the chocolate taste with chocolate chips, and add a spoon of peanut butter along with crunchy peanuts on top. 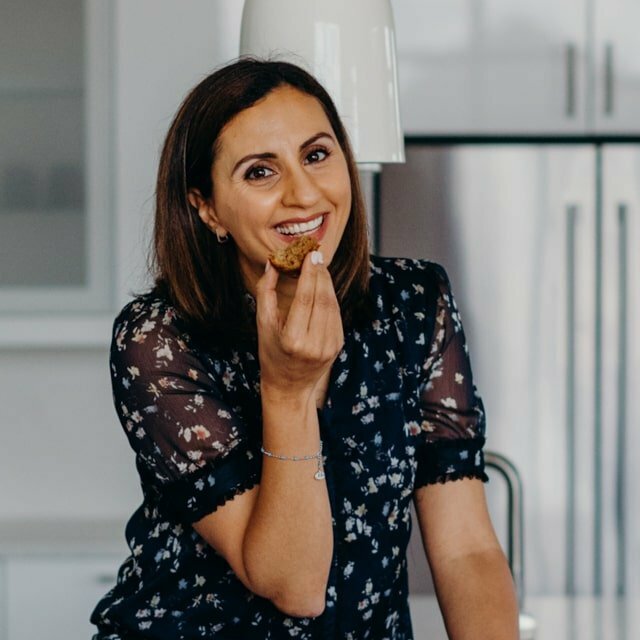 My kids devour this, and it’s a bit on the indulgent side of healthy, but nonetheless still good for you. 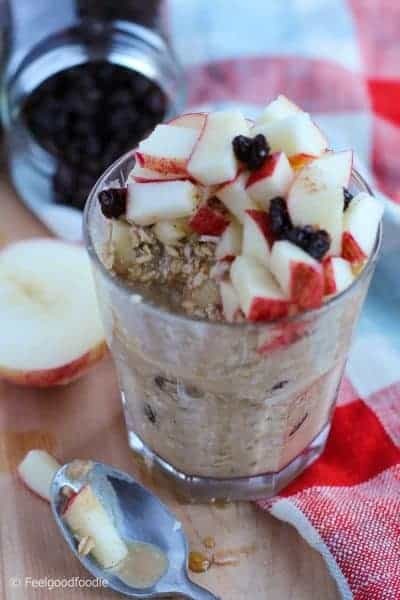 Those healthy oatmeal recipes can get you started with ideas for oatmeal toppings. But there are endless ways of topping your oatmeal. Think of it as a canvas or a starting point. Add some fruit to sweeten it and get some fiber in your body. Add some nuts and seeds for extra protein and healthy fats. Or add spices to boost the flavor without added sugar. Fruit: Fresh fruit like bananas, berries and apples; dried fruits like raisins, cranberries, apricots, dates or coconut; frozen fruits like berries or mangoes, jams, fruit zest or applesauce. Nuts & Seeds: Almonds, walnuts, pecans or peanuts; chia seeds, ground flaxseeds, sunflower seeds or pumpkin seeds. You can also do any nut butter or seed butter. Cooked Grains: Quinoa, amaranth or wheat germ. You can cook them separately or with the oatmeal. You can also add granola. Spices: Cinnamon, cardamom, nutmeg, pumpkin spice or ginger. Protein Powder: If you’re trying to add more protein to your diet, I recommend half the normal scoop. Sweeteners: Honey, maple syrup, brown sugar or agave syrup. Use old fashioned oats for the best consistency. 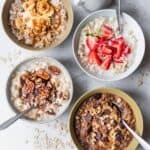 Steel cut oats have a different cooking method entirely, so I would definitely avoid those if you’re following this specific recipe. Quick oats work, but they are pretty mushy in my opinion. They work great for kids though since they only need a minute in the microwave and are easier to chew and digest. Pay attention to the oat to liquid ratio. This is usually printed on the oats package. For reference, it’s always 1/2 cup oats to 1 cup of liquid. 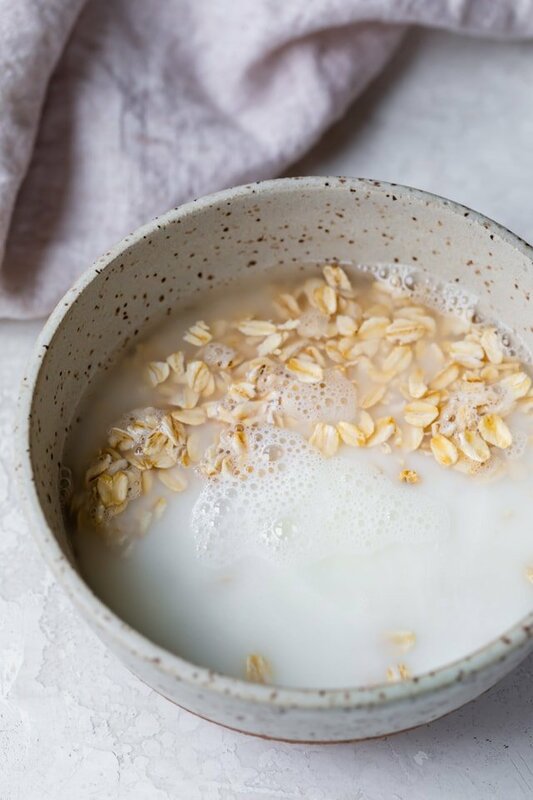 If you use less liquid, it may not fully cook all the oats. If you use more liquid, it may end up looking too mushy. I recommend sticking to the ratio and then either making it thicker by mixing in toppings or thinner by mixing in milk. Don’t forget the salt. I used to wonder why salt was needed to make oatmeal, but then it clicked when I first made oatmeal with salt. 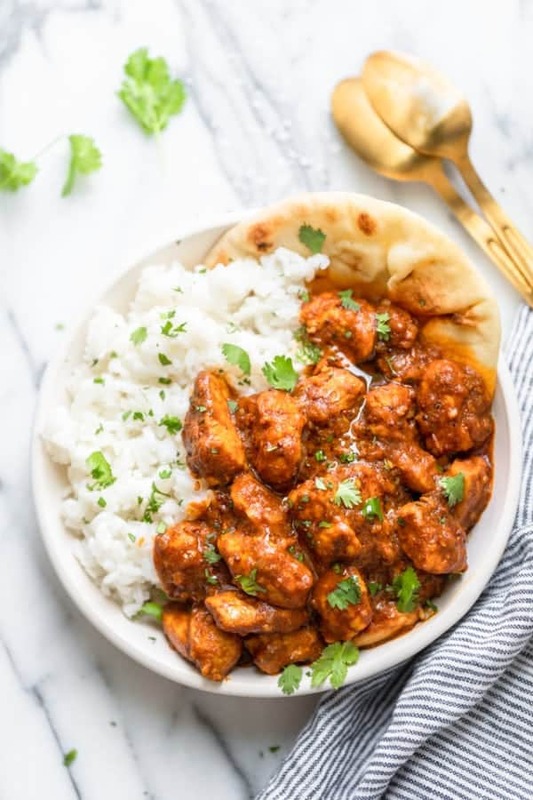 It has a way of making it less bland and really enhances the flavor. It’s hard to explain, but it actually brings out the sweetness and nuttiness of the oats. But all you need is a pinch. You can say goodby to oatmeal packets and now start making your own oatmeal at home. It will be just as easy I promise, but even cheaper in the long run and way more delicious. 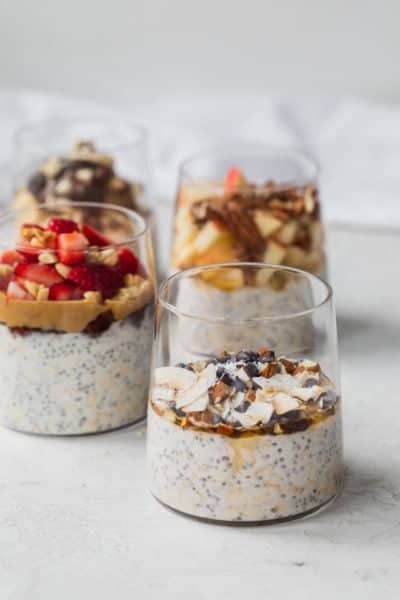 The best part is that it’s totally customizable so you can decide how to make it and what oatmeal toppings you want to add. If you’ve tried these healthy-ish feel good oatmeal recipes or any other recipe on FeelGoodFoodie, then don’t forget to rate the recipe and leave me a comment below! I would love to hear about your experience making it. And if you snapped some shots of it, share it with me on Instagram so I can repost on my stories! In a small saucepan, bring the water and milk to a boil. Reduce the heat to low and pour in the oats. Cook, stirring occasionally, until the oats are soft and have absorbed most of the liquid, about 5 minutes. Remove from the heat, cover and let stand for 2-3 minutes. Stir in the toppings and let rest for a few minutes to cool. Thin with a little more milk, if desired. Serve warm. Make Ahead Tips: You can make the oatmeal in the microwave or on the stovetop in advance. To reheat, simply add a splash of milk or water and microwave for 1 minute. Substitutes: For best results, follow the recipe as is. However you can use all milk or all water in the recipe instead of doing half milk/half water. You can also use any type of milk you'd like.